Many 12V-rated devices can be damaged by being exposed to voltages in excess of 12 Volts – particularly LED lights which have a maximum working voltage typically of 13.5 Volts. Nominally 12 Volt Lead acid batteries typically operate in the range of 12.6V (40% charged) to 13.6 V (100% charged). When under charge, the voltage can easily get over 14V – sufficient to cause damage to sensitive 12V equipment. A voltage regulator is a device which takes an input voltage and outputs a stable fixed voltage. Variable voltage regulators are available (such as the very useful LM317T) which the user can set to output any required voltage (1.25 to 30V). For the more commonly required voltages of 3.3, 5, and 12 Volts there are fixed voltage regulators which can be used to output just one voltage (such as the L7812 12V fixed regulator). Unfortunately the regulators mentioned above have quite a high voltage drop – typically up to 3 Volts. Therefore, to obtain a reliable 12 Volt output voltage, an input of 15V+ is required – more than a 12V battery produces even when under charge. To get around this problem low dropout regulators were developed. A low dropout regulator supplies a fixed output voltage with a typical voltage drop of just 0.5 Volts. This makes them perfect for use with 12 Volt lead acid batteries. Ideally a lead acid battery should never be allowed to get below 12.6 Volts (40% charge), and so since 12.6 – 0.5 is still over 12 Volts, a low dropout 12V regulator will be able to reliably supply a 12 Volt output whenever the battery has sufficient charge. 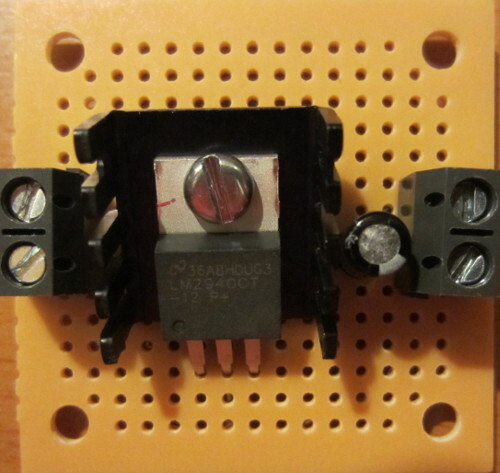 The LM2940CT-12 is a 12V low dropout voltage regulator integrated circuit (pictured above). It can output up to 1 Amp at a fixed 12 Volts DC with a dropout of just 0.5 Volts. It can accept input voltages from 5.45V to 26V DC. It can therefore be used to provide a fixed 12 Volt DC supply to a string of up to ten 12V 1 Watt LED spotlights guaranteeing their longevity. NEW The LM2940CT-12 is now available for sale in the REUK Shop. When the input voltage is below 12.5 Volts – as will happen if you let your battery drain below 40% charge, the output voltage will be approximately equal to the input voltage minus a voltage dropout of 0.1 to 0.5 Volts. With a current draw of 0.4 Amps, the input-output voltage differential is 0.25V, and it is 0.5V at 1 Amp, and just 0.1V at 0.1 Amps. 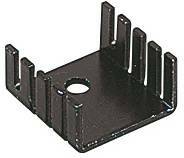 If high voltages, or high currents (between 0.5 and 1 Amps) are to pass through the regulator, then a suitable heatsink* (such as the one pictured above from the REUK Shop) should be bolted onto the regulator to help any generated heat dissipate. * When using a lead acid battery for the input voltage, the maximum power to be dissipated by the regulator is (15-12)Volts * 1 Amp (according to Ohm’s Law) = 3 Watts, and in most applications, the power dissipated will be far lower. The LM2940CT range has internal short circuit and thermal overload protection, so you need to make a special effort to damage one. They are available in 5V (LM2940CT-5), 12V (LM2940CT-12), and 15V (LM2940CT-15) specifications. Click here to view the LM2940 Specification Sheet (PDF) for more technical information. In order to maintain a stable 12 Volt output, an external capacitor (of at least 22uF) must be used to smooth off the output from the integrated circuit (IC), with the capacitor located as close to the IC as possible. NEW We are now selling UK-built complete 12 Volt Regulators in the REUK Shop based around the circuit shown above. If you need a 12 Volt voltage regulator to supply more than 1 Amp of current to power an LCD television, laptop, or large amount of lighting, then take a look at our article on the Amperor ADP-90DC-12. If you need a low dropout voltage regulator which can be adjusted to give a non-standard voltage (in the range 5 to 15 Volts DC), click here to read our new article LM2941 1 Amp Low Dropout Adjustable Regulator. I am setting up a CCTV system with a DVR recorder with built in 250GB hard drive. It runs on 12 Volts and with 1 camera the drain will be about 2 Amps max. It may help to let others know there is another low drop regulator (LT1084CP-12) this is rated at 5 amps and may be an idea for higher loads. There is also a 3 amp and 7.5 amp version. This is the 12 Volt one I put together. 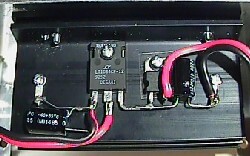 The device to the right is a blocking diode (40 PIV 10 Amp Schottky rectifier with 0.2V dropout) to give protection if the battery is connected the wrong way. The unit will be on float charge with a 85 Ah battery so being able to have battery backup, but I hope this extra information on the above regulators is of help. Rapid electronics sell the 3 and 7.5 amp (adjustable output voltage) versions only. (Click here to view these low drop out regulators now). * Click to view the LT1083/84/85 Datasheet for further information on this range of low dropout voltage regulators from Linear Technology.